Rossvale had to be content with a share of the spoils from a goalless stalemate with fourth-placed Arthurlie at Huntershill on Saturday. There was a feeling right from the start that there weren’t going to be many goals and that both teams possibly would settle for a draw. Vale were unlucky early on when man of the match David Leadbetter burst down the left and fired over an inch perfect pass only to see McGonigle have the ball taken off his toe as he was about to shoot. Two minutes later Kirk Forbes drove forward and found Andy Johnstone whose excellent cross was headed narrowly past by McGonigle. Arthurlie’s best effort of first half came in the 35th minute, Andy Barrowman blasting over after Del McNab beat the offside trap to lay on an excellent chance. Both teams were blocking each other out, but early in the second half the ‘Vale put an excellent attack together when Chris Zok brought the ball down and found Forbes who picked out Gary Giffin but the keeper managed to keep his effort out. Arthurlie replaced Barrowman with Jamie Docherty whose first touch from a free-kick was easily saved by Jamie Donnelly. Vale were getting more of the ball, allowing Matt Niven to break upfield from the full-back position, but after a lovely one-two with Giffin his shot went narrowly by wide. 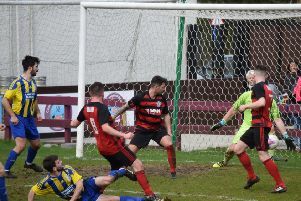 Next it was Arthurlie’s turn again and when Reid fired a cross into the box Donnelly was beaten, but a defender managed to clear off the line. The game was going from end to end and Johnstone headed a Giffin free-kick it down to Hunter, but again the final shot was weak and gave the keeper no serious trouble. A Leadbetter cross then found Zok with only the keeper to beat, but the ball seemed to get stuck between his feet and another great chance went past. With 15 minutes to go McGonigle who tried his luck from about 30 yards out which must have stung the keeper’s hands, as did a Giffin effort a minute later. Five minutes from time Lie’s Connor Bradley saw a straight red when he seemed to make a connection with his elbow on McGonigle, but Vale couldn’t take advantage and a goalless draw was possibly the right result.